Amazing hostel! Lovely people, nice pool! Very clean, and only a couple of minutes away from the beach. The breakfast is nice. The only thing was that there are only 3 showers. De sfeer is top. Gasten en personeel zijn erg vriendelijk en geïnteresseerd in elkaar. Ook geeft het personeel je goede tips voor je reis. De kamers zijn ruimer dan een normale dorn en je hebt een ‘prive’ badkamer! Nice hostel with friendly staff. 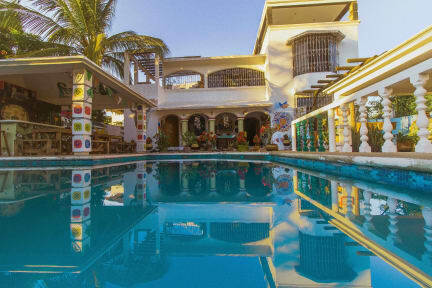 The pool is a plus because of the temperatures in Puerto Escondido. It's close to three nice beaches. They've got nice activity's like yoga in the hostel, and also recommend party's in the city. Breakfast is local food and different every day. Located in a big, pretty colonial house. It was very quiet when we were there. Swimming pool is nice and people that work there were very kind. Our private room was quite warm. + Nice hostel and comfi beds. - Would only recommand you to stay here if you travel as a couple. For a solo traveler not the place to be. Group in the hostel was not open to new people arriving. So if you are looking for a nice chat in the hostel and meeting new people, do not go hete. Only one toilet combined with shower on the first Floor where 3 dorms were located.